The Ink Trap: Day Four of October Peeks at Kraftin' Kimmie Stamps! 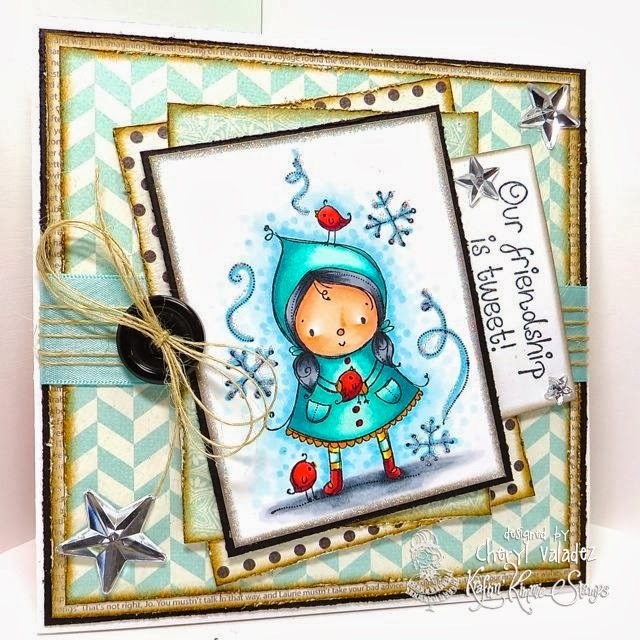 Day Four of October Peeks at Kraftin' Kimmie Stamps! Welcome back to day FOUR of our OCTOBER Kraftin' Kimmie Peeks!!! The awesome new stamps just keep on comin'!! We are SO thrilled to share the newest set of FOUR stamps from Rachelle! Let's call it the CUDDLE UP collection!!! It includes stamps called.... CUDDLE UP & KEEP WARM, FRIENDSHIP IS TWEET, SNOW MUCH FUN and SNOW WONDER! This week our hostess is ALICE! And her challenge is ANYTHING GOES!! So create a card, scrapbook page or altered item with a Kraftin' Kimmie stamp with no restrictions! Use any sketch, any design, any embellishments because Anything Goes! Have some krafty fun and join us this week because we'd LOVE to see your KKS designs. We hope you can play along for your chance to WIN some NEW Kraftin' Kimmie rubbah!!! Beautiful design!! Love your coloring.. I always do!! Fantastic!! Such a very lovely card!!!! Very adorable image and wonderful colouring...love the winter colours. Lovely card! Love the twine bow!